Llama Information on: Llama carting, llama driving, llama showing, driving llamas, llama breeding, classic pack llamas, pack llamas, pack llamas for sale, llama packing equipment, llama consulting, llama articles, llama packing, Flaming Star Llama Packs, therapy llamas, llama therapy, Delta Society pet therapy, Pet Partners llama therapy, trained llamas for sale, llamas for sale, basic llama information, new llama owner information, llama rescue, new llama owner tips, llama facts, Washington llama farm, Llama 4-H, Washington llamas for sale, therapy horse, miniature therapy horse, llamas for sale in Washington state, llama care, 98226 and much more! PLEASE note all of our pictures, information, articles, intellectual property, etc. are all copyrighted. Please respect this and don't pirate our site! If you want to use something, please ask permission. After marrying in 1998, we made arrangements to own 100% of Eagle. Our herd of around 20 llamas currently has several ALSA Halter & Performance Champions and many ILR Halter & Performance Champions. Eagle was our main herdsire who is still the most winning llama in the nation and one of only two Breeder Elites in the show system. ﻿﻿﻿﻿Dazador our gelding was a Non-Breeder Elite of which there are only a handful in the country. We also have two certified PLTA Master Packers, seven driving llamas and six Pet Partners (aka Delta Society) registered therapy llamas. All of our llamas were trained, owned and handled by us! The girls we use have all produced halter/performance champions, packers and therapy llamas or they are maiden girls being shown, packed, driven or doing therapy work. Our llama herd is very diverse and we do everything with them! In 1998 we started our own business of showing, grooming, consulting, clinics, brokering, sales, lessons and very select breeding services. We are active llama volunteers and have had our own 4-H group in the past. JNK Llamas belongs to ALSA Lifetime Membership (Alpaca Llama Show Association), Llama Information Day Group (501c3 non-profit), ILR (International Lama Registry) Show Division, ILR Registry, G.A.L.A. (Greater Appalachian Llama Association), PLAA (Pennsylvania Llama & Alpaca Association), PLTA (Pack Llama Trial Association) & SWWLA (Southwest Washington Llama Association). Niki was a part of the original "Classic Llama" Focus group for the ILR and in the past served as the chair for the ILR-SD Fleece Committee. In addition, Niki is also an evaluator and adviser for the Pet Partners pet therapy national organization. She is currently on the GALA Promotions and Fiber Committees, PLTA Board, President of Llama Info Day Group, Fiber Fusion NW board and on the ILR-SD Fleece Committee. Jeff sits on the SWWLA board of directors as well. Jeff and Niki have been a distributor of Flaming Star Llama Pack equipment since 1997. Niki writes for various association newsletters and American Livestock Magazine. She is an ILR & ALSA Halter, Performance & Fleece Judge and ILR Advanced Teaching Judge. In the real world, she is a secondary substitute school teacher by choice. Jeff works in sales and loves his job too. 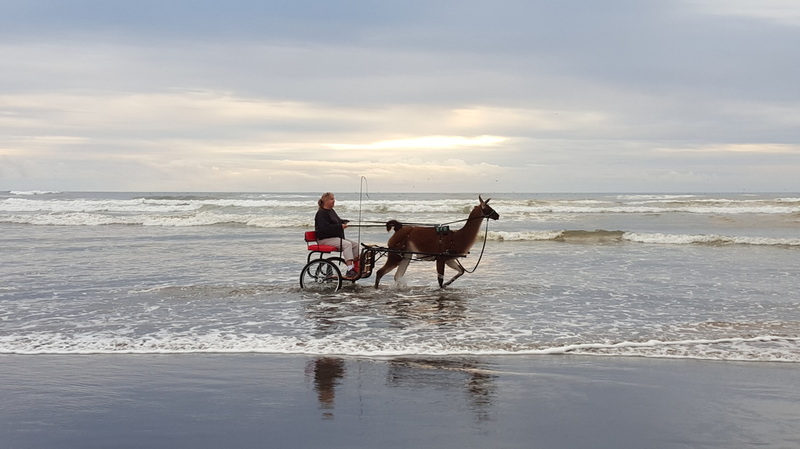 We are are the only people in the llama industry that actually do llama showing, packing with llamas, driving with llamas, llama therapy work, 4-H llamas, spinning (fiber related work), llama breeding, llama training, llama judging/teaching and llama rescue. This has allowed us to evaluate our llama herd from a very critical user's eye and has helped us to build the current herd we have. We believe even "Pet Quality" llamas need to be trained and have proper nutrition to ensure lifelong health. As new llama owners, we feel it is important to have show quality llamas that are sound, even if you do not show them! Some regional breeders claim to have champion show llamas, but truly do not. You can look up any of our llamas on the ILR-SD (International Lama Registry) and ALSA (Alpaca Llama Show Association) sites and see their actual show results. Our show results are legit and proven. They also are not from the local county fairs where there is little competition. Beware and do your homework or you may be a victim! We are both very dedicated to doing what is right for our llamas and new owners. Having a good fit for a new llama owner helps to ensure that a llama has a lifelong home. As we have done llama rescue from less than ideal situations, we understand the problems that come about when a new owner is sold a llama that they are not totally educated about. Select breeding is important to ensure the best genetic and conformationally sound crosses possible. We breed for "All Around" llamas. Llamas that excel in not only halter, but performance, packing and public relations settings. We are breeding just a few llama girls a year as that is what we can efficiently train and work with. Instead of breeding for numbers, we breed for quality. By only having a few cria a year, we are able to focus our energy into those animals to make sure they are well trained and socialized. All of our llama crias shown/trained by us placed Grand or Reserve Champion Novice Performance in large classes at their very first ALSA/ILR shows. Most win in halter too! Please contact us with any questions about llamas or our breeding program. We are currently operating off a wait list for our animals. *NOTE- Because we do have livestock guardian dogs, we ask that you leave your dogs at home when you come to visit our farm. Winner of ALSA's highest and rarest award ALSA Breeder Elite.